"120cm Of Snow in 7 days, In The Northern Forest!" Yes, it was another fun filled week with lots of snow! Actually, we are now getting too much! This last 7 days produced 120cm of snow with the last bast on Wednesday night into Thursday morning. This last 30cm, left us captured as there was no room due to the high snow banks to plow open the road. Lucky, there is plenty of food here for both the dogs and myself and the electricity was not affected. On Friday my friend John Vanderzon (Le Bon Jack), arrived here and cleared the snow with his tractor equipped with a snowblower. The road and the chalet now has enough room to stay open by use of my plow truck. With all the snow, we have had to dig out the entrances to the dog houses even though the dogs do a pretty good job of it themselves. ​All the straw was changed this week and the dogs have nice warm dry living quarters. After a great deal of work on the trails, the dogs got to run on Monday, Tuesday and Wednesday. The above video is of one of the puppy teams with Lilly running lead at only 7 months of age. She looks like she will be a Natural Leader! There are also videos posted on the puppy Page of all the puppies running this week. This was only their fourth time in harness and are showing to be an incredible litter. Wednesday afternoon, both Kelsey and Laura departed from Miortuk to continue their lifes journey. They were a great help here and they will be missed by the dogs and myself. Thank you for your assistance here at Miortuk! 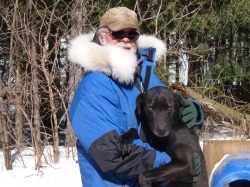 Last Saturday , a good mushing friend, Keith Bryar passed away after a long battle with cancer. RIP My Friend in the future we will run the trails again!